Pretreatment Coatings Market size was over USD 9 billion in 2015 and expects gains at over 5.5%. Positive outlook towards construction spending along with increase in automobile sales should drive coating pretreatment market size. It is an essential precursor stage for powder coatings and offers superior finish along with increasing coat shelf life to the metal surface. Metals on which powder coatings are applied include steel, aluminum, copper, galvanized steel, and zinc alloys. Global powder coatings market size was over 2.1 million tons in 2015 and is projected surpass 3.8 million tons by 2024 with above 6.5% gains. In terms of revenue, the industry was valued at over USD 8.5 billion in 2015 and is likely to exceed USD 15 billion by 2024. This industry is experiencing gains owing to its broad applications across various end user industries including automobiles, furniture, electronics, industrial & household appliances, and agricultural equipment due to its ability to offer product longevity by protecting their components against corrosion. This factor should drive pretreatment coatings market size. These are used in automotive parts such as engine parts, wheels, radiators, bumpers, shock absorbers, coil springs, and mirror frames. Rising environmental concerns related with metal finishing is key factor hindering the pretreatment coatings market growth. Concern over the chromate toxicity is a major obstructing factor for its usage. Investments by company to develop zirconium-based chemistry blend to deposit a zirconium oxide conversion coating on clean metal surfaces should give opportunities for industry growth and reduce environmental concerns. This product produces minimal toxic, regulated heavy metals and generates at least 80% lower sludge byproduct compared to standard zinc phosphate process. Increasing automotive production, mainly in China, Indonesia, Japan, Malaysia, and Taiwan, should propel pretreatment coatings market size. Global automotive production was over 90 million units in 2015 and may reach above 135 million units by 2024, with 4% gains. Metal is an essential component used in automotive manufacturing as it provides overall vehicular structural strength. It is also used in major parts including fuel tanks, engine components, and shock absorbers. In addition, the total steel demand in the automotive industry was approximately 120,000 tons. The aerospace industry is witnessing escalated growth owing to increasing air travel demand mainly due to reduced air fares and increased consumer’s disposable incomes, rising jet sector, and enormous backlogs for new aircraft manufacturing. Metals including aluminum, steel, and titanium are extensively used in manufacturing airplanes, which should favor pretreatment coatings market size. Global airline passenger traffic was 5.89 Revenue Passenger Kilometers (RPKs) billion in 2013. In addition, the global RPK is forecast to reach 15.53 billion by 2033 with an annual growth of 5% from 2013 to 2033. The airline industry is continuously focusing on expanding its revenue by offering alliances and partnerships such as annual subscriptions for premium services, Frequent Flyer Programs (FFP), and on-board duty-free sales. China and India, will have the highest demand for new airplanes with 37% by 2033 due to escalating economic growth in the region. Airport authorities and governments, mainly in the ASEAN countries, are willing to extend their aviation infrastructures to capitalize trade and tourism. Global anti-corrosion coatings market size generated over USD 3 billion business in 2015. These protect metal components against degradation due to oxidation, salt spray, moisture, or exposure to various industrial or environmental chemicals. It protects metal surfaces and act as an obstacle to inhibit contact between corrosive materials or chemical compounds. Strict environment legislations on account of the VOC content in product may hinder pretreatment coatings market size. Pre-paint conversion coatings market includes iron phosphate, zinc phosphate, chromate, chromate free and blast media. Iron phosphate conversion coatings market size may generate over USD 2.2 billion revenue by 2024. It is preferred for indoor or outdoor equipment due to low investment cost and unit chemical prices. Wipe, immersion and spray are the processes for iron phosphate conversion coatings. Iron phosphate pretreatment coatings ranges in color light yellow to blue-red. In addition, it provide reduced corrosion resistance than zinc phosphate process, is easy to operate and less expensive. Metalworking fluids market size should witness over 3% gains over the foreseeable period. The product is used as coolants in applications such as metal removal, metal forming, metal treating, and metal protecting. Metalworking fluids enhance vehicles part life by reducing wear, thermal deformation and increase lubrication. In addition, it provides excellent surface finish in welding and cutting zones. Pretreatment coatings market size from automotive generated over USD 2.8 billion business in 2015. Increasing consumer preference towards automobiles to enhance vehicles appearance, durability, and protect from acid rain, UV radiation, foreign particles, and extreme temperatures should drive industry growth. 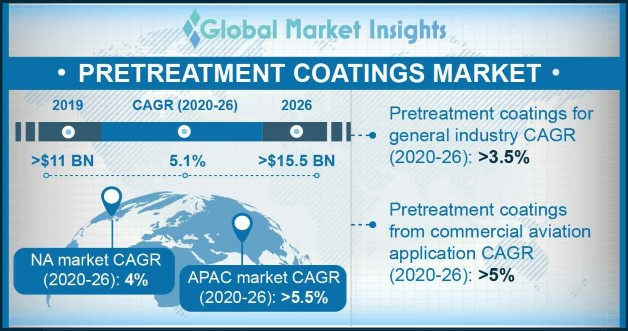 Pretreatment coatings market size from general industry witness over 5% growth. It includes off-road & agricultural vehicles, appliances, ventilation, office furniture, general manufacturing, and architectural aluminum. Agricultural vehicles use zinc and iron phosphate for heavy industrial equipment. Architectural aluminum uses chrome-free prepaint and anodizing chemicals for residential and commercial aluminum products. Appliances use iron and zinc phosphate for dryers, refrigerators, and washers. Pretreatment coatings market size sees highest consumption from metal applications and generated over USD 6.5 billion business in 2015. The process depends upon finished products end-use requirements which deposits conversion layer on metal surface. Phosphating is widely used in metal pretreatment process. Pretreatment coatings market size from aluminum application should witness highest gains at above 4.5%. It is integrated with strip cleaning process, and coating process. Aluminum is used mainly in applications including architectural or transport and food packaging. It has tendency to endure natural oxidation and forms a thin aluminum oxide layer on its surface. China pretreatment coatings market size should witness gains at above 5.5%. Increasing aerospace production and development, mainly in China, Indonesia, Japan, Malaysia, and Taiwan is should drive industry growth. Germany pretreatment coatings market should generate over 600 kilo tons demand by 2024. Major automotive manufacturers presence in Germany will drive business growth in Europe region. Increasing vehicle production in Germany, UK, France, and Italy along with demand for replacing ageing vehicles should drive industry growth. France pretreatment coatings market size may witness average industry gains. Increasing coil industry mainly in construction area should drive regional growth. Global pretreatment coatings market is consolidated with top four surface treatment industry participants catering to over 50% of the total demand in 2015. Major industry players include Chemetall, PPG Industries, Henkel and Nippon Paints. Albermarle Corporation’s Chemetall Surface Treatment operates under Chemetall brand name and is a provide services for plastic, metal and glass substrates in various end user industries. Other prominent companies include AkzoNobel N.V., 3M Company, Axalta Coating Systems, Kansai Paint Co. Ltd, Troy Chemicals, Abrasives Inc., Barton International, and Cym Materiales. Coating pretreatment market are involved in number of research and development projects with industrial partners and scientific institutes on regular basis which help to fulfill needs for more cost efficient and environmentally friendly technologies. Coating pretreatment market process is segmented into chromating and phosphating process. Phosphating is further classified as iron and zinc phosphating. Chromating is further classified as green and yellow chromating. Conversion coating or phosphating is and application of zinc or iron phosphate coating to the substrate. This pretreatment conversion coating process is crucial as it increases finished coating performance, increase corrosion resistant, and improves bonding. The major raw materials used in their surface treatment segment include phosphates and phosphoric acid and phosphates, non-ferrous metals such as nickel and zinc. The raw materials used in operations are purchased from various suppliers at competitive prices.